Currently, investing in a luxury watch is not only about owning something of great quality but also about being part of an elite fraternity of enthusiasts who treasure the intricacies of micro engineering. This affiliation can become even more exclusive with the acquisition of a limited-edition model. Such timepieces come in various shapes, designs, prices and numbers, but regardless of which catches your fancy, you can be content in knowing that not too many examples of your purchase exist on the planet. 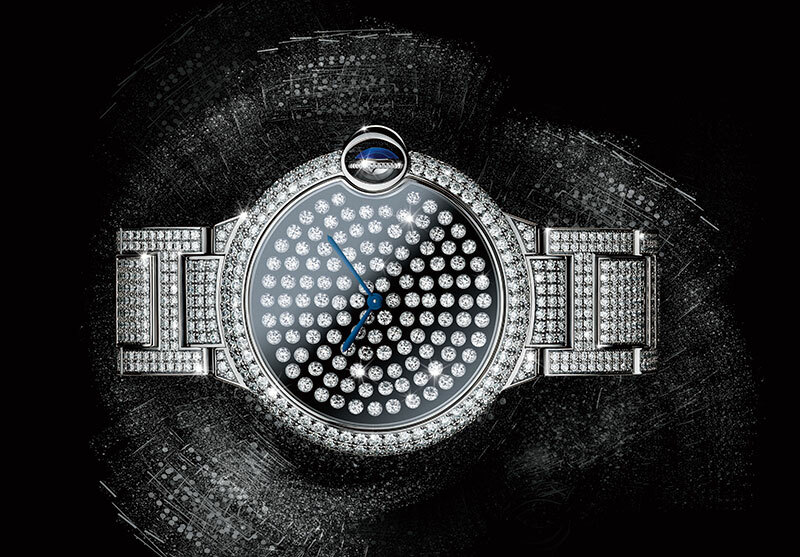 Perhaps the brand’s most arresting watch, the Ballon Bleu de Cartier Vibrating Diamond Setting brings precious stones to life. The vibrating setting used in the manufacture of this spectacle is inspired by a 19th-century technique called ‘trembling setting’. The round-cut diamonds on the dial are placed in a way that allows for a slight shake, enabling them to constantly catch light. And if these moving diamonds aren’t enough, the 42-mm watch features more brilliant-cut stones all over its 18-carat white-gold case and bracelet, creating a kind of luminosity even in the dark. 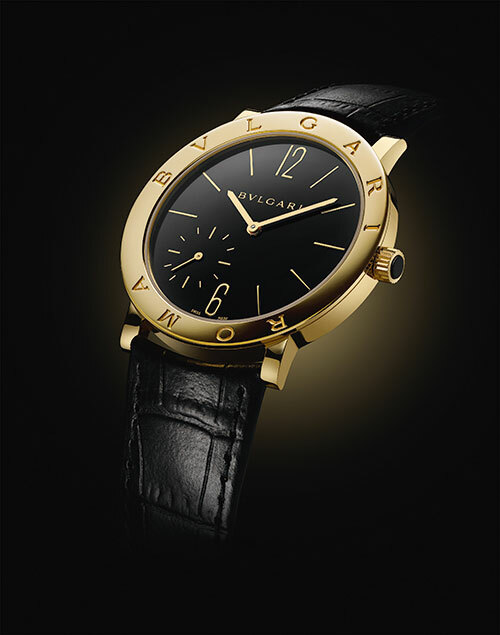 To celebrate the 40th anniversary of the iconic Roman coin-inspired Bulgari Roma timepiece, three new commemorative creations are on offer, one of which is a stunning collector’s model — the Bulgari Roma Finissimo in yellow gold. The understated aesthetic of the original is enriched with the finesse of the watchmaker’s own ultra-thin mechanical hand-wound movement, decorated with the most beautiful embellishments that call on the manual skills used in circular graining, chamfering and Côtes de Genève. Another example of the number of limited pieces corresponding to a date, the maestro Frank Sinatra Limited Edition is an ode to the musician’s December 12 birthday. 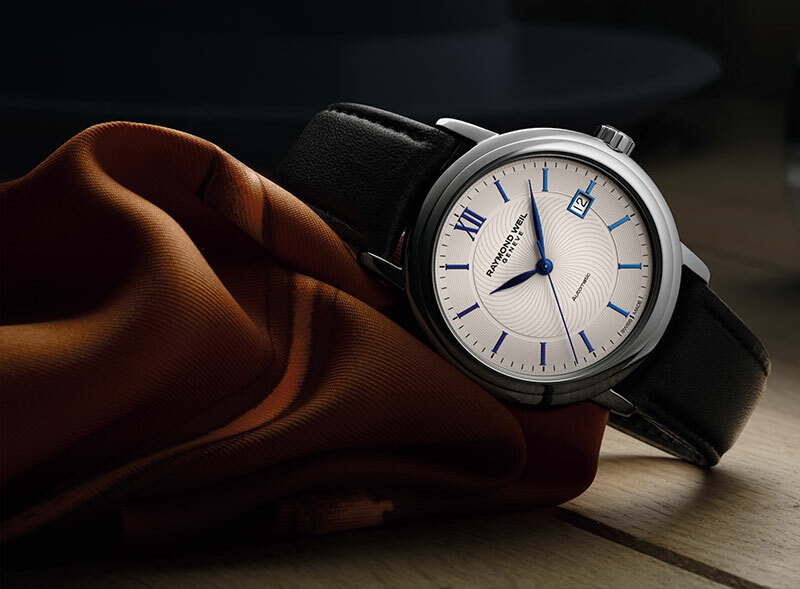 The said number is the only Roman numeral on the silver dial and, along with the hands, index markers and contours of the date window, is in a bright blue hue — reminiscent of Sinatra’s Ol’ Blue Eyes Is Back album. 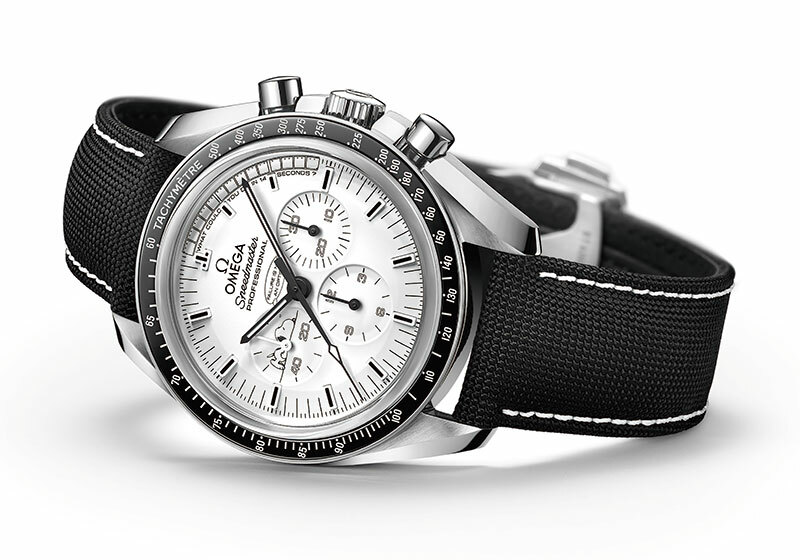 The Speedmaster Apollo 13 Silver Snoopy Award honours the memory of the Apollo 13 mission — launched in April 1970 — which faced trouble when an oxygen tank exploded, giving the crew just 14 seconds to correct their course. They famously used their Omega watches and, upon their safe return, awarded the SFA Silver Snoopy Award to the brand. The dial of this watch has the quote ‘Failure is not an option’ from the 1995 film Apollo 13. The highlight of the timepiece is its case back — a 925 silver medallion, resembling the pin that accompanied the award, which is surrounded by dark blue enamel. 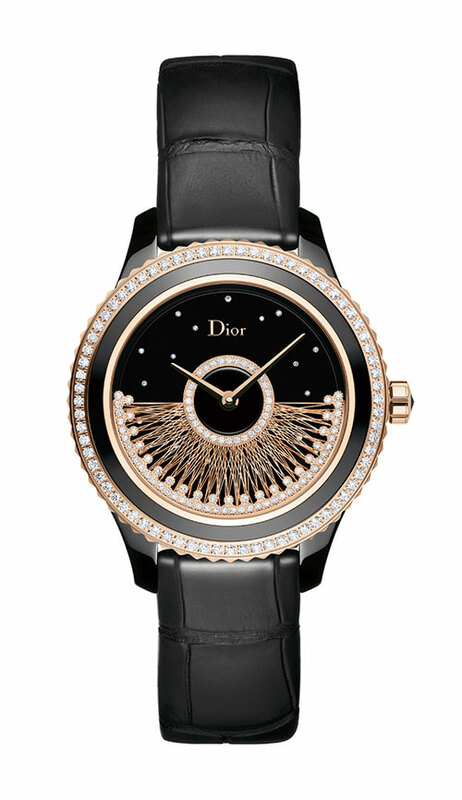 Gold thread is given pride of place in the design of the Dior VIII Grand Bal “Fil d’or”, thanks to the nimble fingers of a lacemaker from Le Puy-en-Velay — the birthplace of the almost-extinct art form of gold-thread embroidery. Making the most of the ‘Dior inversé’ calibre (inverted calibre), diamonds and gold sensually accentuate the black ceramic and pink-gold timepiece. 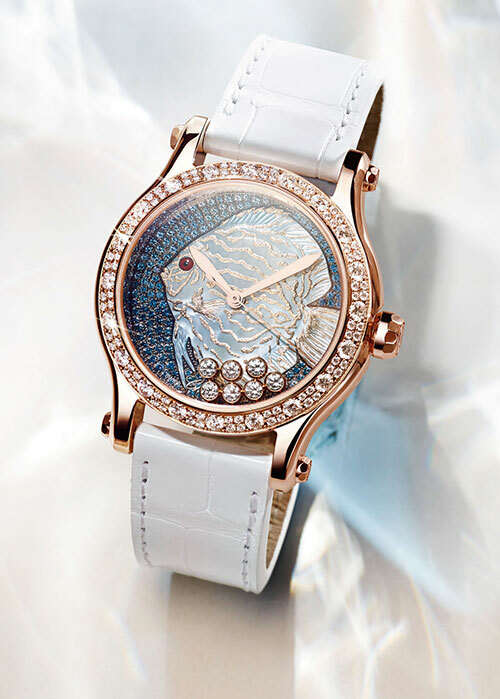 A set of 12 high jewellery timepieces, the Lady Arpels Zodiac collection is one to bookmark for upcoming birthdays. 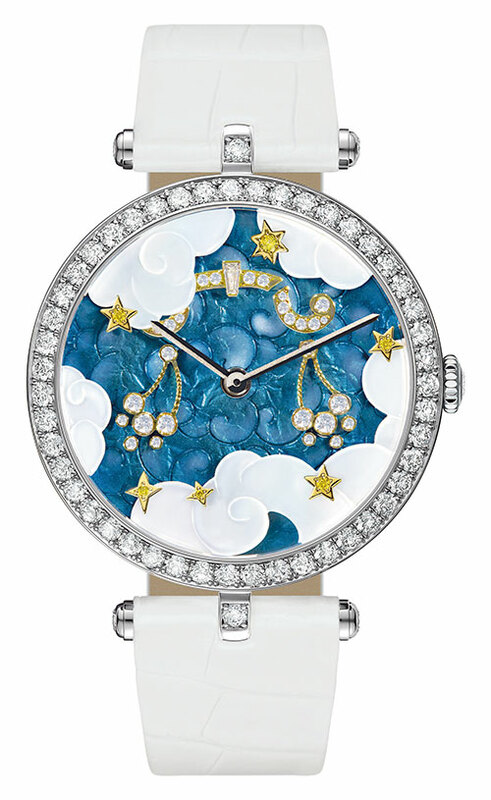 All presented in the same 38-mm white-gold case with a bezel and crown set with round diamonds, the watches depict Western zodiac signs with each dial incorporating different artistic techniques. An engraving that corresponds to one element of either earth, water, air or fire adorns the background. The sparkling new Happy Fish watch in turquoise and gold features luminescent moving diamonds dancing across its beautifully crafted dial. Below them is an almost regal-looking fish with a deep red jasper eye, hand-applied gold leaf embellishments and delicate engravings on the shimmering mother-of-pearl base, which glows in the dark. Graded shades of snow-set blue sapphires make up the background. Inspired by the shape of the violin, the Alacria Royal Rose — Limited Edition is resplendent. Powered by a CFB 1850 quartz movement, the watch is marked by delicate hands. 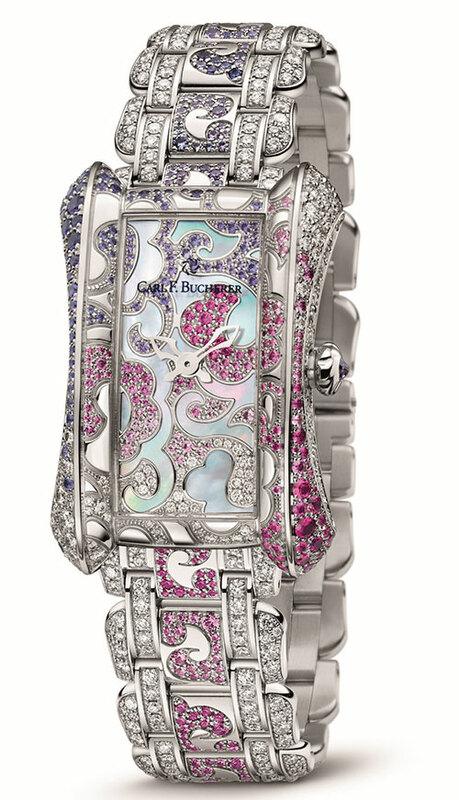 Sapphires and diamonds swirl across the elegant model in floral designs, offsetting the 18-carat white-gold case, adorning the mother-of-pearl inlay on the dial and creeping onto the delicate strap in warm hues of blue and violet. 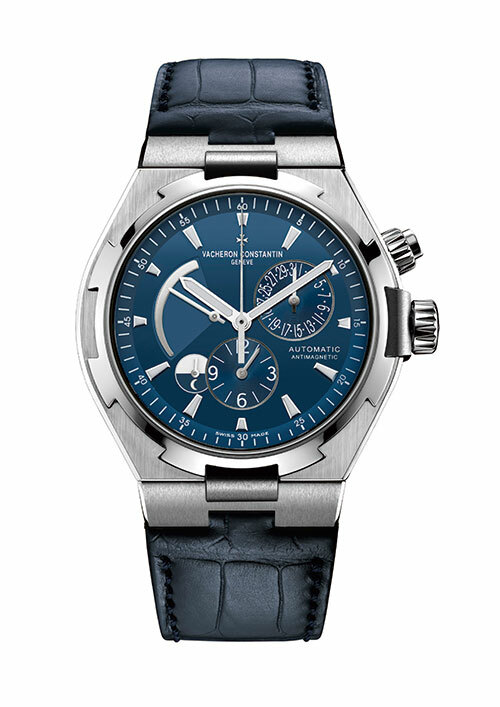 The Overseas Ultramarine Blue Dual Time combines tough aesthetics with a plush finish and high-end movement. It features a relatively complex movement, displaying the hours, minutes and seconds on the central axis, a power reserve indicator at 9 o’clock, the date in a sub-dial at 2 o’clock and a second time zone at 6 o’clock. 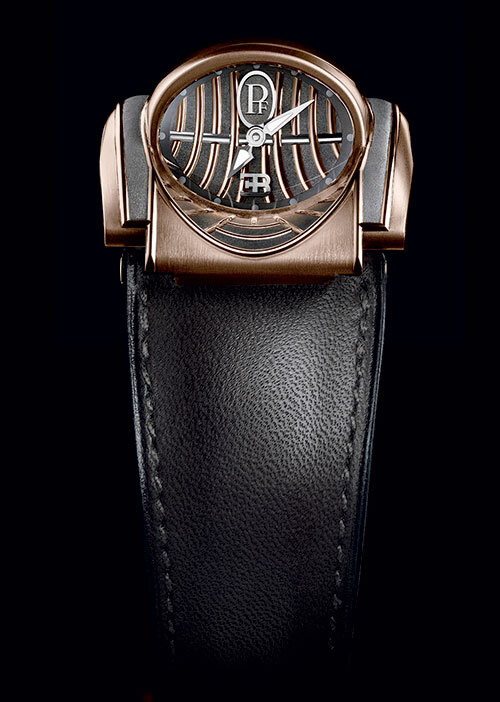 A change from the dramatic watches the brand has a reputation for, the understated New Retro watch was inspired by a 1950s cigarette case belonging to its founder Fawaz Gruosi. This year, a unique version — New Retro Black Stripes — has been created for the Only Watch 2015 auction. Four rows of black diamonds on the case back distinguish this one-of-a-kind timepiece from the regular version. Known for one of the most significant partnerships in the industry, with top luxury car brand Bugatti, the brand presents the Bugatti Type 370 Mythe, one of the three unique timepieces created in celebration of the 10th anniversary of this relationship. 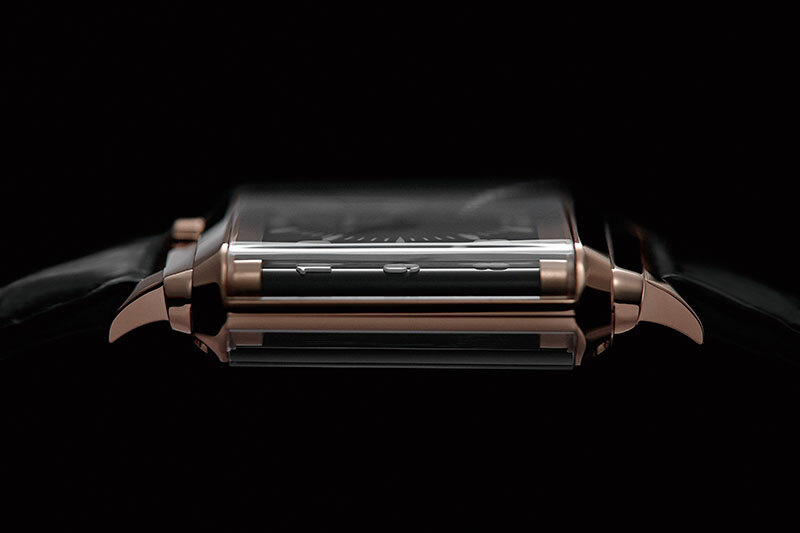 Designed as a novel-looking ‘driver’s watch’, it allows the wearer to view the time from the side, while the case on top is reminiscent of the front hood and engine section of a classic Bugatti car. To commemorate the 125th anniversary of the death of Vincent van Gogh, this watchmaker, along with the Van Gogh Museum in Amsterdam, presents the Reverso à Eclipse Van Gogh Sunflowers. 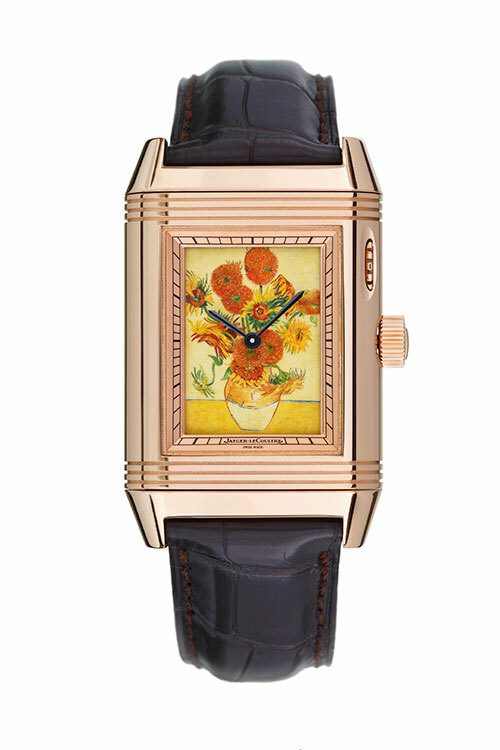 The watch features one of the Dutch post-Impressionist’s most legendary works titled Sunflowers (hence the name) through the rare fine art tradition of miniature enamel painting, concealed behind delicate shutters on the dial. We definitely have our eyes on music maven Kelly Rowland’s pretty pink TW Steel CEO Tech Kelly Rowland Special Edition watch. Cameron Diaz looks radiant while showing off her limited-edition steel version of the TAG Heuer Link Lady Trilogy watch, ring and bracelet set.